Summer is quickly coming to an end but that doesn’t mean it’s going to be the end of our summer cookouts! One of my favorite things to do in the summer is invite people over to hang out and enjoy some awesome food. We like making the main course on the grill because it’s nice not to have to heat up the house with the oven and it’s fun for people to stand around the grill chit chatting while we cook the meal. My husband is usually outside with the men doing the grilling while I’m inside finishing up the side dishes and trying to be the “hostess with the mostest”. I make a lot of tasty side dishes for our cookouts but one side dish I almost always have is some type of pasta salad. It’s great because I can make it with any vegetables I get in our weekly CSA, it’s cold so it goes perfectly with burgers or steaks hot off the grill, and it’s easy to make. 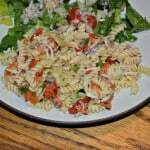 I try to do something a little different with my pasta salad each time I make it so people are surprised by the flavors. I’ve totally been drinking a lot of Gold Peak Tea over ice because it’s the perfect refreshing beverage in the summertime. I usually get the unsweet tea in the 64 oz. bottle and keep it in the refrigerator so I can just grab it, pour a glass, and go. 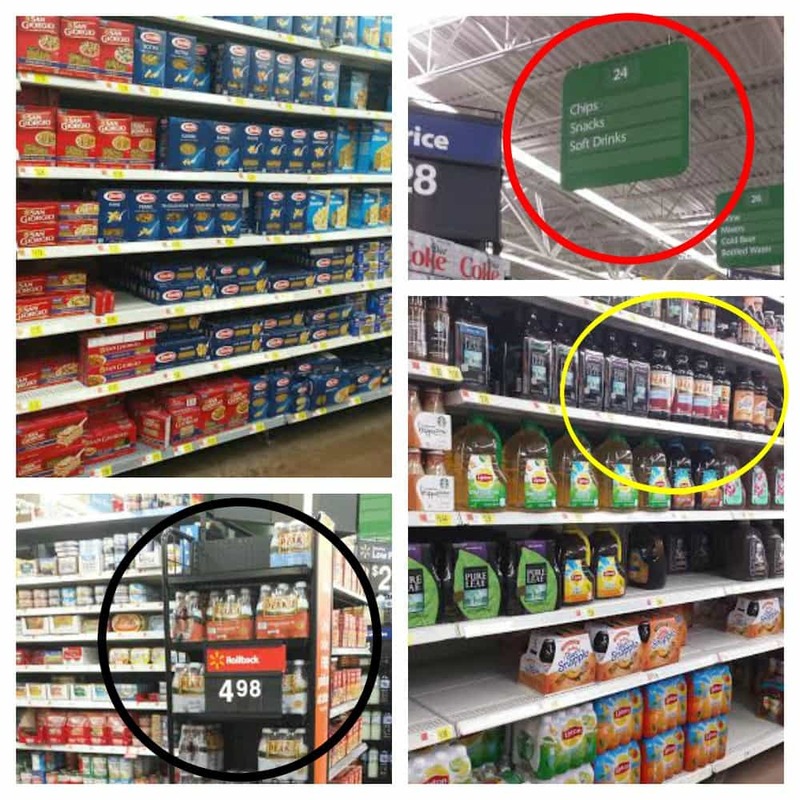 They’ve recently come out with the Gold Peak Tea 6 pack at Walmart which is great to have on hand for cookouts or when company comes over so everyone can have their own bottle. My favorite is the green tea made with real sugar. I wanted to use that sweet green tea flavor in my pasta salad but wasn’t sure what to do with it. 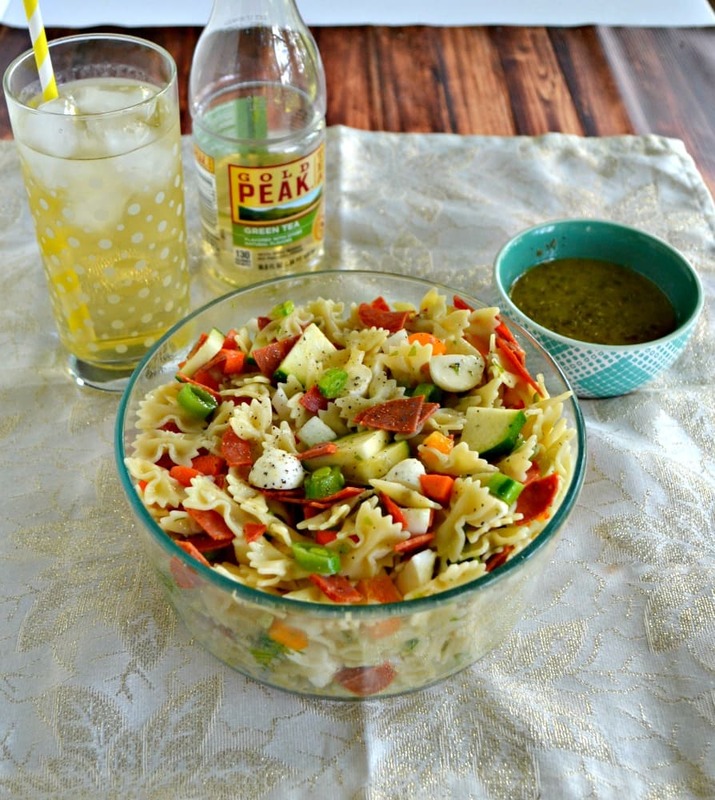 I finally came up with not one but 2 fun ways to use it in my pasta salad. I boiled the actual noodles in the tea to give them a tea infused flavor and then I used the tea to make a green tea vinaigrette to go along with the salad. Isn’t that a fun summer idea? 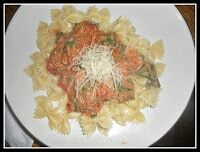 To make the pasta salad I used Barilla Pasta Mini Farfalle in the blue box. 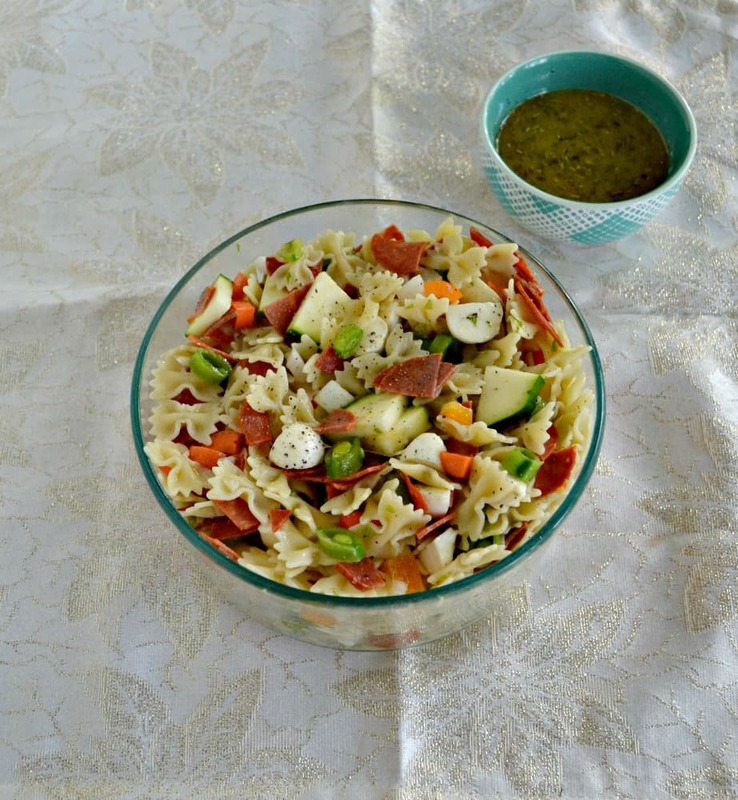 I like using the mini farfalle because they are easy to pick up with a fork and the vegetables get stuck on the noodles which makes the pasta salad even better. I love that Barilla Pasta cooks up al dente every time because I like a touch of firmness to the noodles in my pasta salad. 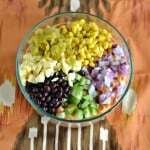 It also makes for a quick and easy to make side dish perfect for BBQ’s and cookouts. While the pasta was cooking in the tea I chopped up all the vegetables for the pasta salad. I had peas, onions, and peppers from my CSA. I then grabbed a zucchini from my garden and a carrot I purchased at the farmers market. I also grabbed a handful of oregano, basil, and Italian parsley from my herb garden. I love being able to use vegetables and herbs from my own garden in my dishes. I was able to find some fresh mozzarella balls and also added in some pepperoni because you’ve got to have some type of salted cured meat in a good pasta salad. I set the pasta salad aside to make the green tea vinaigrette. If you’ve ever made a vinaigrette the basis of it is simply oil and vinegar. After that you can add anything you want to turn it in to a delicious dressing. I added in the Gold Peak green tea, some fresh herbs from the garden, salt and pepper, and just a hint of Dijon for spice. You can mix up a vinaigrette two ways. One way is to whisk the ingredients together until they come together and make the dressing. The other way, and the one I find easiest, is to put the ingredients in a mason jar or small bowl with a lid and shake for 30 seconds. It comes out perfect every time. The green tea vinaigrette is a little sweet from the tea, a little spicy from the Dijon, and is simply delicious. 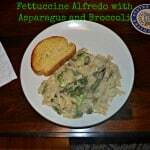 The herbs give it a real fresh flavor which is nice for an outdoor party in the summer. I like putting the dressing on a few hours ahead of time so that the Barilla pasta has time to soak up the flavors of the dressing and then I make an extra batch to put on the side of the pasta salad in case anyone wants a little more flavor. 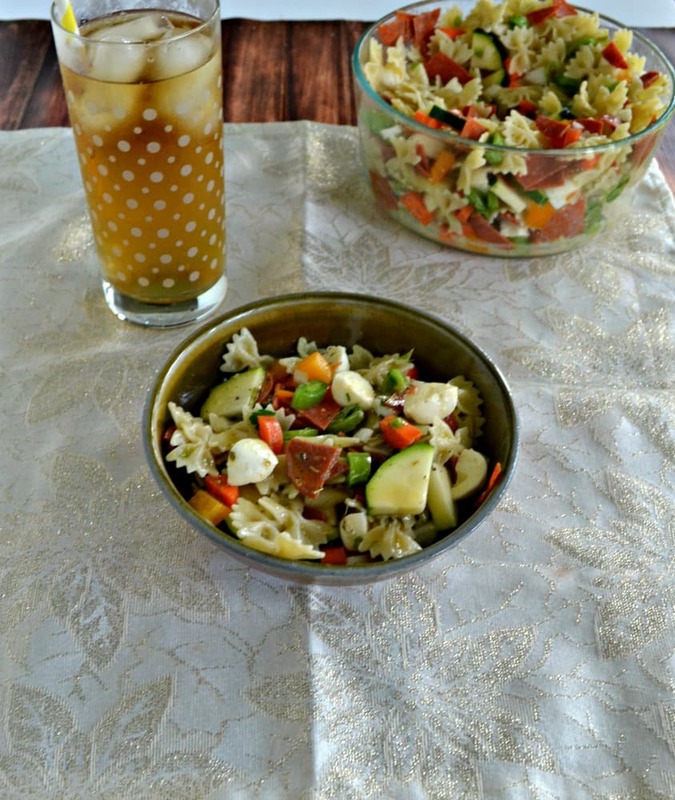 Pasta salad made with tea steeped noodles, fresh vegetables from the farmers market, and a sweet green tea vinaigrette to bring all the flavors of summer to one delicious side dish. To make the pasta salad pour the green tea and water into a large saucepan and bring to a boil over high heat. Add in the Barilla Mini Farfalle and boil for 7 minutes, stirring occasionally. Drain the pasta in a colander and run cold water over the noodles. Pour the noodles into a large bowl and toss them with the zucchini, onion, carrots, peas, pepper, and fresh herbs. Gently stir in the mozzarella and pepperoni. Set aside. 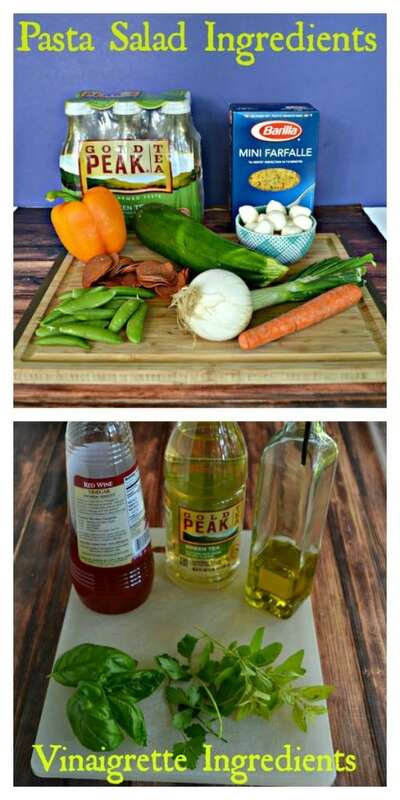 Pour all the ingredients for the vinaigrette into a mason jar and shake well. Pour over top of the pasta salad and toss to coat. 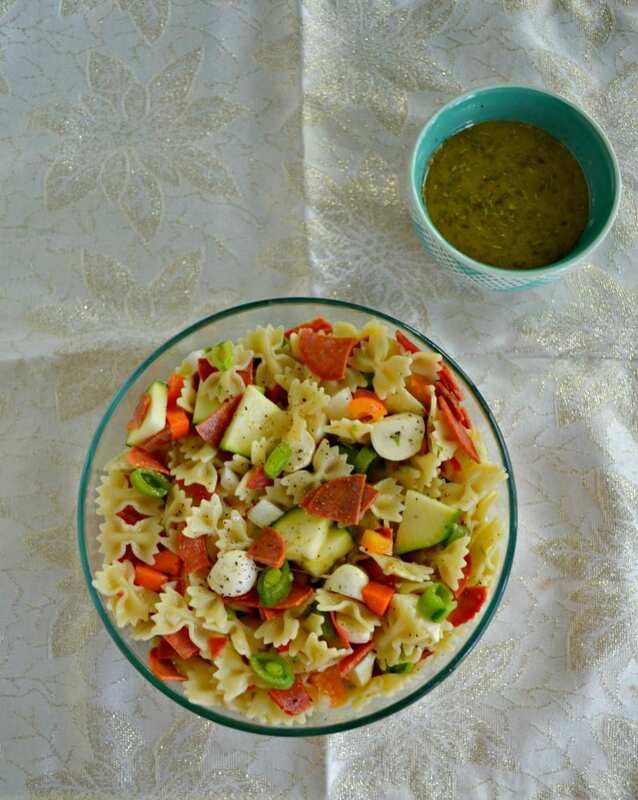 Before serving, make a second batch of the vinaigrette to serve along side the pasta salad. Do you want to try making this recipe for your own summer cookout or party? Grab a coupon for $1 off when you buy any two (2) 64 fl oz bottles of Gold Peak Tea on Coupons.com. Then get on your Ibotta app and earn $1 when you buy 3 Barilla Blue Box Products or Barilla Pesto Sauce. If you want even more great summer recipes make sure to check out the Social Hub! Yumm this sounds delicious! Have to make the most of the rest of the summer and this seems like the perfect way to do that!